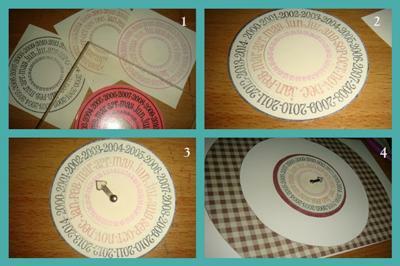 From the different patterned papers, make or cut 3 concentric circles that will fit in the cardstock. Temporarily place the innermost circle and the middle circle (or what I call the middle ring!) just so the outermost circle can be aligned. Adhere the outermost circle onto the cardstock. Remove the innermost and middle circles. 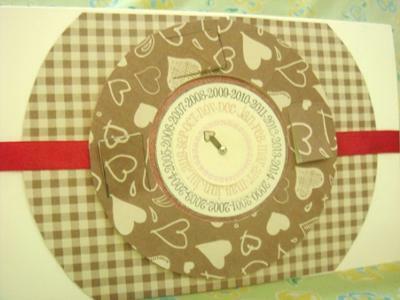 Place a red ribbon at the center of the cardstock. We leave the base first and work on the calendar part. Stamp the round calendar stamp three times using coordinating ink colors. Cut around the first calendar (black ink) for the year; the second calendar (brown ink) for the month; and the third calendar (violet ink) for the days. 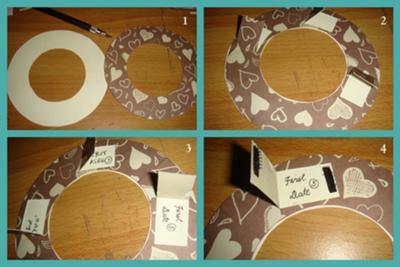 Then, make an arrow (pretty much like a clock hand) with a small strip of paper. Use a small brad to hold the calendars together. The innermost circle (from Part A) should also be part of the calendar (the brad should punch through it as well) for the years, months, and dates to be movable. 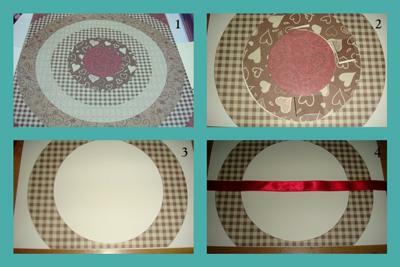 Make another circle on a white cardstock the same size as the middle circle (use the middle circle as your pattern for tracing). Then, draw three small rectangles on the middle circle with a pencil. Then, cut the top, bottom, and right edges of the rectangle, leaving the left side simply scored, just like in the picture. Next, adhere the middle circle onto the other white circle. Be careful not to glue the rectangular part we just cut. The rectangular part now serves as a “window”. When you “open” it, it exposes the white cardstock behind. Feel free to write any significant events in your life as a couple on this part. In this card, I wrote the more common significant events like “first kiss”, “first date”, and “first ‘I love you’”. Then, to ensure that the windows can open and close, use small strips of fasten tape (Velcro). Glue the calendar at the middle of the card. Using foam tapes, adhere the middle ring. 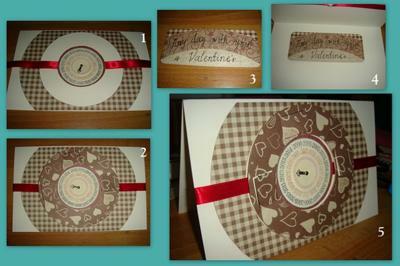 Since this is a calendar-themed card, using a spare strip of patterned paper, I wrote “Any day with you is Valentine’s…”. Adhere this paper strip inside. You now have a not-your-regular, interactive Valentine’s Day card! Your significant other, the recipient, is then to tell the dates of when the events happened by moving the year, month, and date calendars, and the arrow as well. First of all, I’m a sucker for calendars. In my small stamp collection, I have two calendar sets. So, I started with the idea of using them. Second of all, I’m known to be very good with remembering dates. And when people remember those significant dates like I do, I am beyond happy!